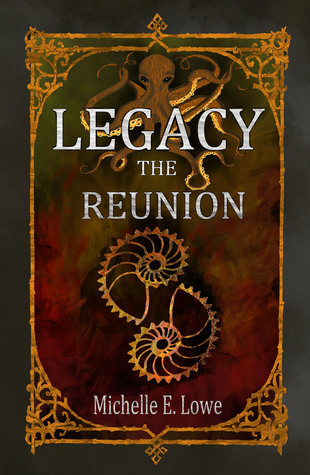 Genre - Steampunk/Fantasy/AdventurePages - 282Publication Date - April 6, 2018Format - KindleStars - 🌟🌟🌟🌟🌟If you were a fan of “Legacy (The Legacy Series, Book One) by Michelle Lowe, you are going to love, love, love the second installment “Legacy The Reunion, The Legacy Series, Book Two”. A non-stop adventure fantasy romp from start to finish. The primary emphasis of this part of the series deals with Pierce Landcross and his adventures through Victorian Era southern England to escape his parents from Newgate Prison and follow clues to find an inheritance left to his mother from her brother, There is a line in the last chapter of the book where Nico says goodbye to Pierce and his friends “Merci. Never in my life have I experienced so much excitement.”, well Nico, all I can say is you should have been around from the beginning of the book it would have take your breath away. There is a much stronger “steampunk” element to this installment, along with the fantasy and adventure that, as I said, just never stops. I am so looking forward to the continuing saga of the Landcross Clan and their adventures. I also quite enjoyed the elfin element introduced in this part of the ongoing storyline. The first book had some vampire action, not so much in this one however. Although mentioned they play a smaller part to the plot. I also like the idea that if you did not read the first book you will be able to read this one without needing much guidance. Even though this book pretty much begins where the first left off, it could easily be read as a standalone. I however recommend reading the entire series to get the full impact.From the back cover: Britain’s infamous thief, Pierce Landcross, has returned to face justice. On the way to London, he learns that his long-lost parents are being held in Newgate Prison. To save them, however, he must first escape his own dire situation.But not everything goes according to plan, and Pierce finds himself in yet another adventure as well as a mystery he never anticipated.A small fortune has been left to the Landcross family and to collect it is to follow a series of clues. Pierce is joined by a beautiful and adventurous young woman named Taisia Kuzentsov, and together they set out to the Netherlands to retrieve this inheritance.And danger isn’t too far away. Tailing them is a bounty hunter who aims to get his hands on the money and the reward offered for Landcross.With every clue Pierce and Taisia find, they uncover untold secrets about the family and soon learn there is more to the journey than initially believed.